As I write this, it is past noon in the Chicagoland area on New Year's Eve Day. It is already January 1, 2015 half a world away. The time of trend analysis and resolutions has begun, or will when the bleary-eyed and more clear-eyed and can think more clearly about how they resolve to live 2015. I've been following what others purport are the trends to watch but also what some believe are the considerations of 2014 that will directly and indirectly inform the direction of some of those trends. Let's begin with a look back at a few things reported in Education Week about the teaching profession. First we have the chart that suggests why teachers are leaving the profession: too little prep time and a teaching load that's too heavy are the two primary reasons, according to the research done by Richard Ingersoll. According to Ingersoll, the issue is about teacher retention. And that, quite frankly, shouldn't come as any surprise to any administrator. 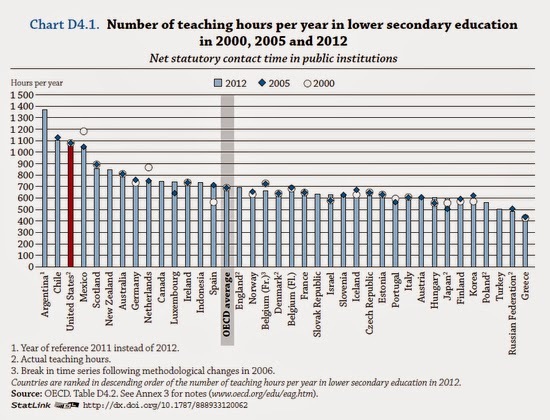 Comparatively we have the chart that exhibits how hard teachers are working. 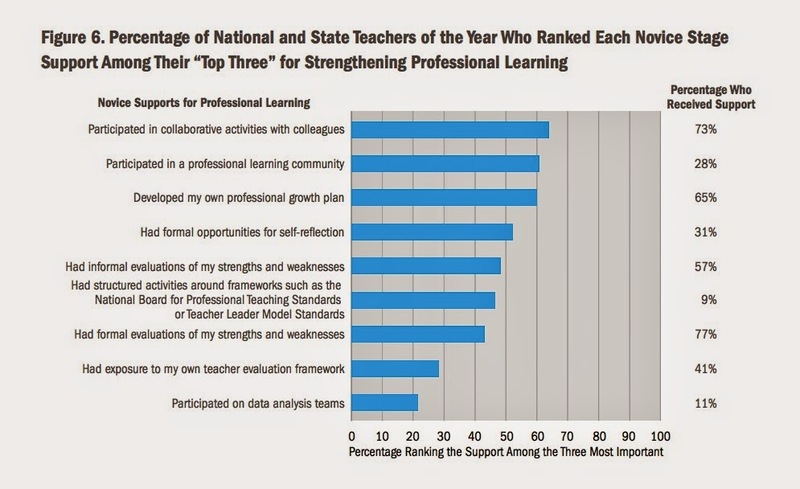 In the Education Week article, this chart is listed as Chart #8. This chart claims to be "teaching hours," which could mean time spent only in the classroom but could also include prep time. It's really hard to say without thumbing through the entire OECD report and examining other charts and reading the information about the data actually reported and collected. So take this chart with those very extensive caveats. Having said that, however, those of us who know, are, or were teachers and at any level (including higher education) know that a 40-hour work week in education is a myth. Most teachers, unionized or otherwise, work more than 40 hours a week, whether for grading, their own learning, prep, or just taking care of administrivia. I juxtapose these two charts because my anecdotal research and experience tells me that time that teachers try to allocate for prep gets sucked up by administrivia or other ill-planned or badly executed attempts for PLNs, grade level meetings, or just "other duties as assigned." For some the actual teaching load is to great, but for many the teaching load is compounded by "other duties as assigned" or whatever phrase might be used to camouflage the expectations. We also know the majority of teachers want to learn, want to learn from and with each other and/or those who have been brought in to coach and mentor them. The majority of teachers want to improve their craft, but they also want time and opportunity to reflect on their teaching, to get feedback on their teaching, and to develop a plan to improve with the kind of support, feedback, and coaching that will offer them a reasonable chance to succeed. As we look back at the trends and issues of 2014, we should take a peek ahead at what might be influencing education in 2015. These three trends are as good a place as any to start. There has been a tremendous amount of conversation regarding competency-based learning (CBE), and not just for higher education. I see this popping up in K-12, too. My concern is that people blather a bit about CBE without having any understanding of what it is or could be, or its implications. It's worth considering some of the drivers listed in this article and discussing their viability and potential implications, thoughtfully and purposefully. Towards the end of 2014, there were more conversations about "informal learning" which has morphed for some to "social learning," which is fed, in my opinion, by the resurgence of constructivism as seen in personalized learning, which is influenced by blended and flipped learning, which was influenced by our continuing evolution of thinking about differentiation. Mobile learning, or learning-on-the-go, continues a trend of just-in-time (JIT) learning and job-embedded professional development. An idea that continues to gain traction is combining CBE with developing learning and skills as students need them rather than teaching students a lot of stuff in the hopes they will store it up until they need it, and then be able to figure out what stuff they need for that situation. Is it reasonable? Practical? Efficacious over time? Good questions to which we can't and won't know the answers for a while which is also problematic as many of us no longer (or never did) have the patience to wait a realistic period of time for a realistic answer. But if social learning, CBE, and mobile learning are going to be realities of 2015 (and beyond) learning, then we need to have thoughtful and purposeful conversations about how to implement changes sooner rather than later and to provide our teachers with the support, time, and coaching they need to try to keep up with the actual changes, not the possible changes, for which their students need to be prepared. And that means, in my opinion, that changes are implemented in waves. What high school students will need to prepare for college or be better prepared for the work force most immediately is different from what middle school students will need to prepare for high school and then to be preparing for college some years out. All of that demands thoughtful and purposeful planning, and realistic resolutions for change.